It’s easy for graduating high school seniors to picture their dream school based on the programs offered and the location, but often times the cost is overlooked until later in the decision-making process. We surveyed nearly 1,500 parents to find out how they plan to pay for college and if their budget takes a role in their child’s college choice. According to CollegeBoard, tuition and fees for a public four-year school have increased by over 210% in the past 30 years, after adjusting for inflation. Although parents are aware of the true cost of college, only 36 percent would push their children towards a lower priced school. One way that parents are helping their children pay for college is with a 529 plan, which is a tax-advantaged savings plan that allow parents to save for future college costs. The benefits of contributing to a 529 plan are the low maintenance costs, low impact on the student’s financial aid package and tax benefits. That said, we found that 80 percent of parents have nothing saved in a 529 account, and 84 percent who do have a 529 account, have less than $5,000 saved. There are other ways outside of a 529 account for parents to save for their child’s tuition like contributing to a Coverdell Education Savings Account, custodial accounts, IRA accounts and more. 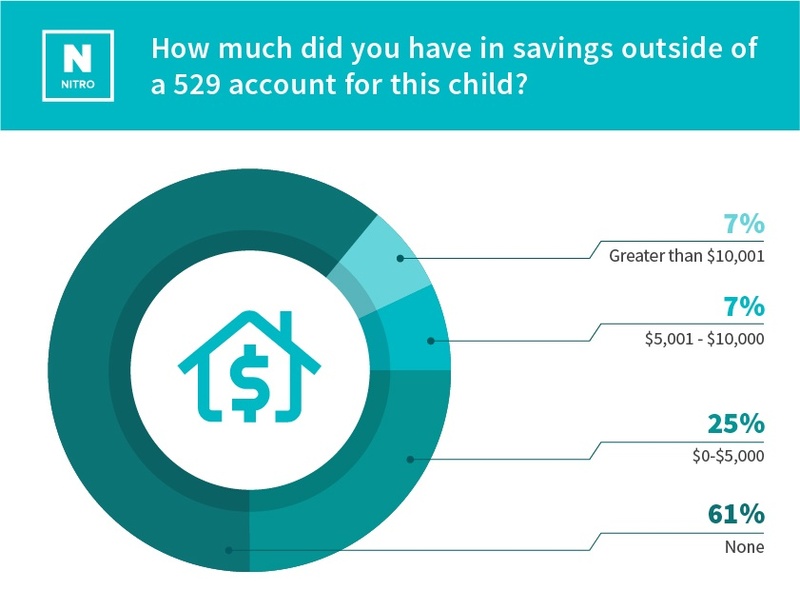 We asked parents how much they have saved outside of their 529 account and 61% said they have nothing saved for college. Fortunately, there are numerous ways to help pay for college including financial aid, scholarships and student loan opportunities. If parents want to prepare for their financial future, it’s important for students and parents to find out how they’ll pay for college, which can be determined by filling out The Free Application for Federal Student Aid (FAFSA) once it becomes available on October 1. Of the 98% of people who filled out the FAFSA, we found that 31 percent of parents filled it out on their own and 56 percent fill it out with their child. 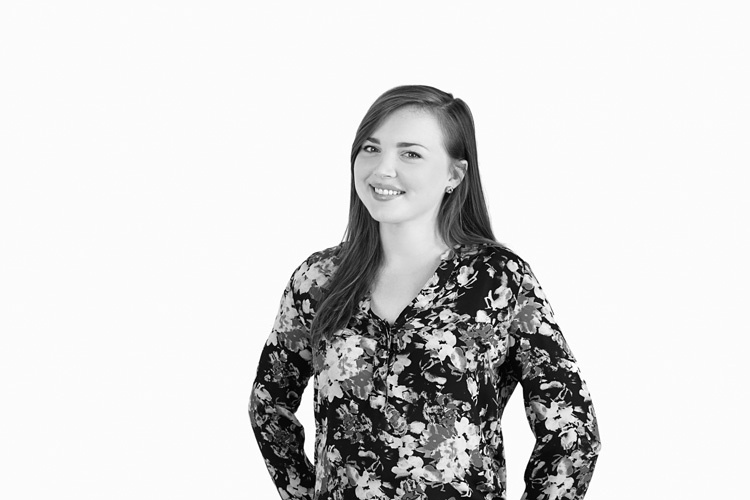 Although the application can be completed in one sitting, there are a number of questions that can take time to gather the information for, so it’s important to start the process as soon as it’s available. 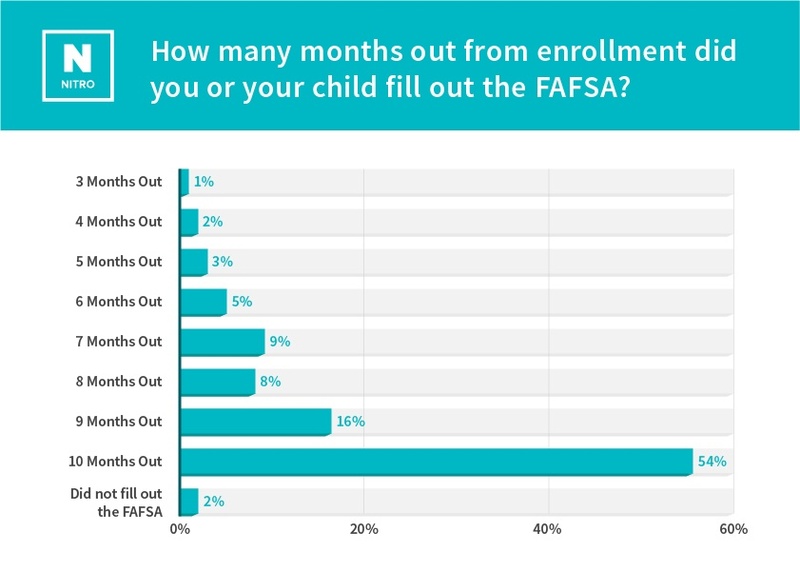 See the results below to find out on average, how many months before enrollment high school seniors and their parents filled out the FAFSA. Many parents and students plan to rely on financial aid, but we found 50 percent of students received less than 5,000 of financial aid (not loans) for their first year of college. With the cost of tuition, fees and room and board for private four year colleges at $45,370, and public four-year colleges at $20,090, it’s important for students and parents to consider saving in advance and take out student loans from a lender with good rates and terms. 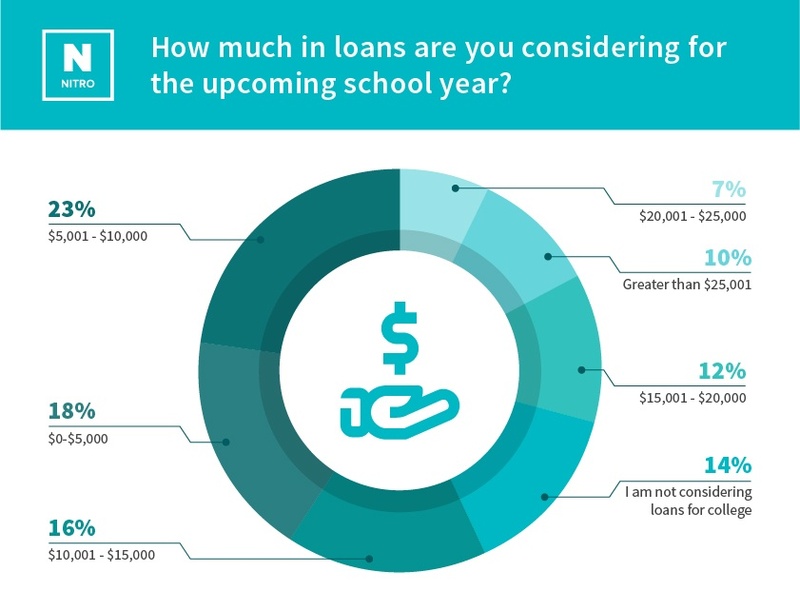 Results show that 86 percent of parents are considering student loans, and the majority of them plan to take out between $5,001 and $10,000 per year. 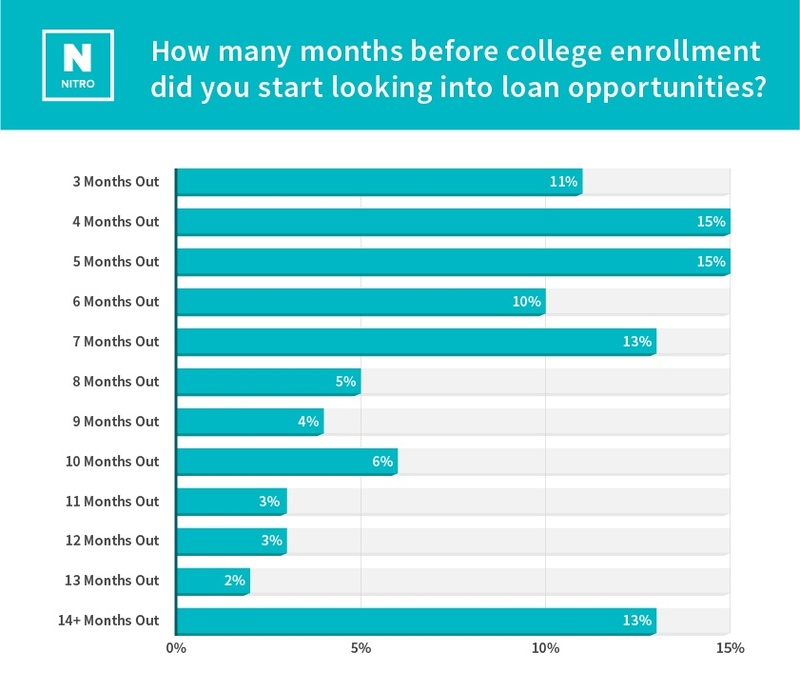 Of the parents who plan to take out student loans, 64 percent didn’t start looking at loan opportunities until after January 1. Since a bulk of the application process and school selection is between October and December, it can be helpful for parents to consider how much they’ll need to take out in student loans before their child selects a school. It’s common for students and parents to pay for college through a variety of resources, but one of the more obvious ways to cut college costs is by attending a less expensive school or community college for the first two years, and then attending a college or university for the final two years. That said, we found that only 28 percent of parents would push their child to attend a community college for the first two years of school. It can take time for parents to help determine a college that suits their child’s future both professionally and financially, but we found that nearly 58 percent of parents felt that their child’s high school didn’t prepare them well throughout the process. Overall, one of the most important parts of selecting a school is for students and their parents to communicate about costs through the entire process. We found that 73% of parents feel like they communicated well with their children about college costs. However, it’s never too early to start thinking about how parents and their children can prepare and save for college. We analyzed data from our May 2017 parent scholarship survey, which collected responses from 1,490 parents who have students enrolling in college for the Fall 2017 semester.